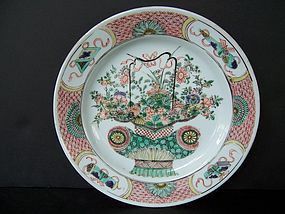 From our Chinese Polychrome Collection, a good Kangxi Period (1662-1722) flower basket plate executed in soft famille verte enamels. The flower basket motif is generally associated with symbolizing longevity and abundance, but sometimes its association with one of the most enigmatic and eccentric of the Eight Immortals, Lan Caihe, is overlooked. Lan Caihe was actually the patron saint of florists whose distinguishing attribute is the flower basket. But since so many of the legends and fables concerning Lan Caihe paint such an over-the-top eccentric picture of this particular immortal, this association with the longevity motif is overshadowed. Size and Condition: 8 1/8 inches in diameter. Some light rubbing to the enamels, and some very minor rim fritting barely worth mentioning but just noted for accuracy and completeness.